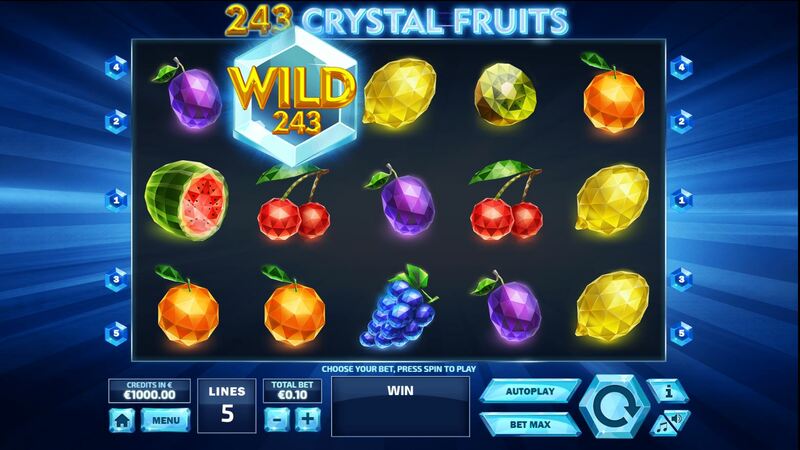 243 Crystal Fruits is a casino game that merges the new with the old-school as far as online slots are concerned. Featuring the classic fruits and lucky 7’s we all know and love, it has a futuristic overlay and a wicked WILD to spice things up. So get your 5 a day by spinning those reels and hitting the wins for a chance to accumulate some big real-world cash prizes. There are tonnes of online play slots to choose from. Tom Horn Gaming live and breathe their motto: “When you have fun, so do we.” Their omnichannel operation provides a broad suite of slots online as well as video poker, keno, bingo and table games like roulette and baccarat. Try to view new slots games which range from something saucy like Red Lights to something silly like Monkey 27. 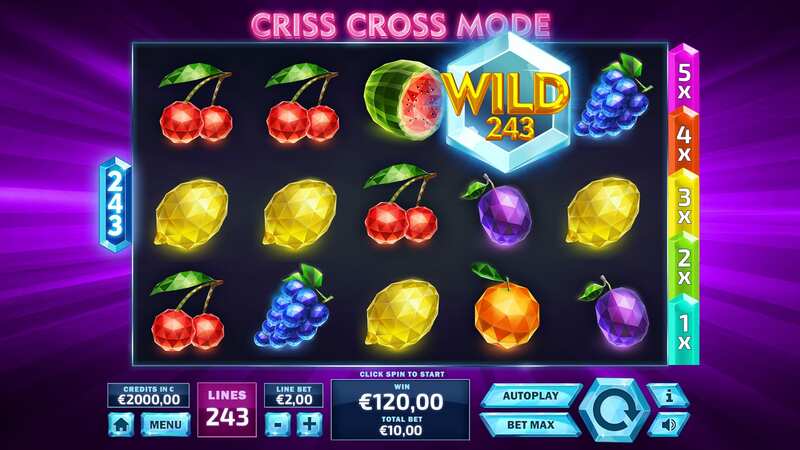 243 Crystal Fruits has 10 bet levels across its 5 paylines, ranging from 0.20 to 100. One neat touch is that by hovering over the payline numbers on either side of the Gameboard, you will see the winning lines displayed. We recommend new players to play the best new slots like this! Visually and musically, this online slot goes for a futuristic feel. The light synth line that scores the core game feels icy cool and fits well with the blue sunburst background. The board itself has 3 rows across 5 reels, typical for the average slots online. All buttons on the screen continue the crystalline ice blue appearance. The crystalline effect naturally continues with the polygonal fruit design, fusing traditional fruit symbols with a modern aesthetic. The lowest value fruits are the lemon, cherries, plum and orange. Grapes, kiwi and watermelon account for the trio of mid-tier symbols while lucky number 7’s the highest value icon on the board. They afford 10x for 3 of a kind, 20x for 4 and 40x for 5. The single WILD is an ice cut crystal with ‘WILD 243’ across it. It is a joker that can substitute all of the regular symbols in the game. Hit a winning combination with the use of a WILD on the 2nd, 3rd or 4th reel and you will activate the 243 Respin Feature. This constitutes the slots only bonus feature, so enjoy it while it lasts! During this round, there are 243 ways to win. The symbols in the winning WILD combo explode and are replaced by new symbols, leaving the opportunity to make new combinations. A multiplier meter increases with each subsequent combo, continuing until there are no more wins or until the maximum 5x multiplier is reached. The last things to note with this take on the classic casino game are the Collect and Gamble buttons. The collect allows you to take your winnings while gambling sees you guess if a card is red or black to double or nothing your current win. Why not take a look at some of the slot promotions available on Wizard Slots.